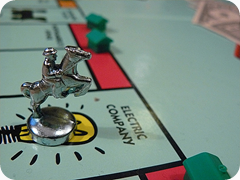 About 10 years ago I played Monopoly a lot with a group of friends. I learned a few things about personal finance that I have recently been pondering and thought I would share. We didn’t have a lot of time. Often we would play during a lunch break, so speed was the biggest factor. There was no messing around with cash and making change. You pass go, you hit 200 M+ on your calculator while the next person is already rolling the die. Quick start. Along the same lines as #1, there wasn’t an elaborate setup. We simply added 1500 to our calculators’ memory and we were good to start. Simplicity. There is no manually math, if someone owes you $18 for landing on your space, you add 18, they subtract 18. Don’t have to worry about mistakes or making change with the bank if you don’t have the correct bills. Overall picture: It is difficult to see just how much you have when you are working with cash and its tedious to count all your money before making a purchase. With a calculator you always know how much you have. Tough decisions made easier: Chances are when you get going, your not going to have the cash in hand to pay all your rent bills. After paying that bill and ending up with a negative number, you know exactly what you need to make up the difference and you can then determine whether to mortgage/sell properties or sell houses/hotels and not sell more than you absolutely need to. No Debt Allowed! The fact is, if you don’t have the money to pay for something, you have to be creative to come up with it. 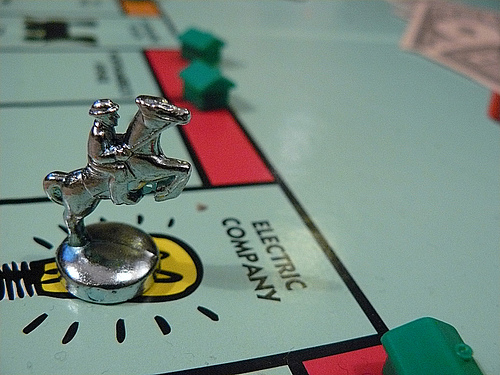 Can you image playing Monopoly in the negative? The game would never end. I think in life there is often more creative solutions to get and stay out of debt, but often we choose the easy route of credit, and therefore we never win. You win with assets. (And remember the point above, these assets are all paid in full). Sometimes buying a property will put you at the brink of bankruptcy, but I’ve learned don’t always be afraid to go out on a limb, because that is where the fruit is. It is best to be first. Money follows speed. He who accumulates properties and monopolies first has the greatest advantage. Honestly and integrity matter. Any victory obtained by questionable means is never as sweet. Stick to the rules and winning will be much more fun. Never underestimate the salesman! A good personality can go a long way. You don’t want to make enemies or others will gang up against you. Even with nothing to work with, a good negotiator and salesman can work things to his advantage and surprise everyone. Stick to your game plan. Don’t depend on luck. Yes, some games can be determined by the lucky (or unlucky) roll of the die, but I’ve found that following a winning strategy consistently is most beneficial. Keep moving forward. Things get better. Even when things get bad and you feel down and out, hang in there, keep passing go, you never know how things will turn out. If you lose today, there is always tomorrow. Cash is emotional. While I described the benefits of using calculators, I’ve found that handing over a yellowish-orange $500 bill "hurts" a bit more than subtracting 500 from your calculator. Observe winners. If there is one person that is consistently winning, observe them closely. Pick up on winning strategies and implement them yourself.